Just want to give you an update on Abbey. She is four months old now and about 18 pounds. 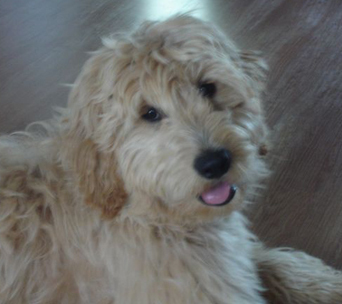 We often call her Abbey Doodle because she is fun and a little silly, so it seems to suit her very well. We do love her! She enjoys chasing after toys we throw in the backyard. She brings them back - sort of! We are still working on that. She is a very lovely natured pup. She likes to be close to us, and will follow us to be near us. We have two cats. She is not agressive but would like to play with them and often tries to lick their face or ears. Mostly my cats try and keep their distance except for maybe teasing her with dangling their tail down near her nose. She loves people and finds it so much fun to meet new people and dogs on our walks. People comment wherever we go how adorable she is. She has a very wavy golden coat that is a bit two tone in colour with blonde, and she has darker apricot ears. The groomer trimmed her face so we can see her black eyes. The groomer commented on what a nice wavy coat she has. The groomer told us that if we brush her completely for five minutes a day we should be able to keep her coat a bit longish rather than have her shaved. So far so good. She bit the brush at first, but now sits quietly for her five minute daily beauty treatment. We have completed 5 of 6 puppy lessons. She has quickly caught onto to sit, lie down, sometimes stand. She's pretty good with give-it, come, leave it. She is probably one of the most playful in the class. She loves almost all the dogs, and runs around interacting with all the puppies. She can run like the wind. We are thinking she might like to particiapate in fly-ball competiions when she is older. 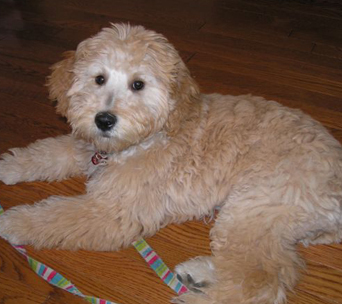 We are very thankful that we found your website when we were looking for a Miniature Golden Doodle. We want to thank you for all the support you have given us when we were making our decision to purchase her and the many tips and encouragement you have given us after we brought her home. We can tell that you love dogs, so we are very thankful to have found such a caring breeder! Blue is fitting in wonderfully, we love him and he has become a constant companion to my son Dawson, even my husband who has always been indifferent to our family pets is showing more interest than usual. Blue has been sleeping through the night for the last couple of nights. He is very smart and loves to be around people. We had a major scare the other day...we had left Blue in our back yard which is fully fenced in and Dawson (my son) and I came out the front door to clean the front yard and when we went around the garage to get our tools, we noticed that the back yard gate was wide open. Blue had been outside by himself for at least 20 minutes by that point and being a curious puppy we thought for sure he would be gone. Dawson starting running to the back yard screaming his name and I ran up and down the street to see if he was nearby, and to our relief he was still in the back yard! He started yelping in a way we had not heard before as Dawson must have scared him when he came running around the corner yelling...we were so happy he was OK, and still do not know how that gate was left opened. This really shows Blue will be a loyal dog...we will also be talking to the vet about micro-chipping him when he is fixed at 6 months. Blue loves his walks and is very good on a leash. He looks so cute because he prances and holds part of the leash in his mouth. We are using a harness for him. I am hoping he will some day be my running partner...we already know he loves to swim as he can't seem to stay out of the puddles. He is waiting to get into obedience school as ours only runs in the summer. He has already learned a few good manners but we want to be sure he is a polite dog, even though he displays alot of good tendencies naturally . He has been in the vehicle a few times, and while he doesn't complain to much he does not look very comfortable with the whole idea just yet. We are also waiting for the vet to visit Hay River as ours is from Alberta and comes in once a month so Blue is on the waiting list to have an overall check up and his next shots..
She is now 21.2 lbs and 14 inches at the withers. We would be interested in knowing how Camo's siblings are doing and how big they are now. he has been to the vet for two visits and now has all of her shots. We have the spaying scheduled for late June. She enjoys going to the vet because she knows she will get treats. We are almost finished our 6 weeks of puppy school and Camo is doing great. She is such a fast learner. She is doing very well at the come, sit, down, off, stay, on your mat, and out commands. Housebreaking went well - her last accident was over six weeks ago. Camo has a great temperament with adults, children and other dogs. We consistently get feedback from people who meet her that she is so calm, quiet and well behaved. We feel that the excellent early socialization that was provided by Millpond Doodles is one of the key reasons that she is so well behaved. She rarely barks and it is only when she wants to play. She does not mind when we touch her feet, ears or mouth and is very relaxed when we brush her coat. 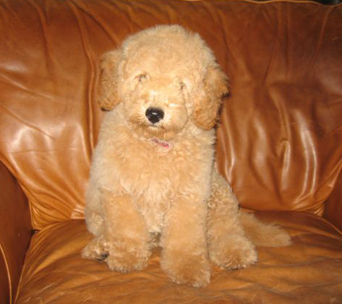 ne of the reasons that we selected a mini Goldendoodle is that we wanted a non-shedding and hypoallergenic dog. We can certainly confirm that both are true. We find very little dog hair around the house, and my mother is allergic to dogs but has had no allergic reactions around Camo. As first time dog owners, Karen and I were also very comfortable with Millpond Doodles as the breeders. They clearly demonstrated that they treat the dogs well and show them all the love that they need when they are puppies. We were glad that they raised the puppies in their home along with their other dogs and children, so that they were well socialized. Don and Teresa were also able to give us all of the advice that we wanted. When we picked up Camo, we were given a toy, blanket and a scrapbook of early pictures - this was yet another demonstration that Millpond Doodles cares about there dogs. My family and I are the delighted and very proud owners of a Mill Pond Doodle miniature f1b male puppy named Cody (parents are Tess and Cooper). Cody was a present for my daughter's 12 year old birthday this year in July and below are two pictures of him at exactly 3 months of age, and he weighs 8.8 pounds. Even though Cody is my daughter's dog, I have to admit to becoming personally involved with this wonderful puppy. I was able to watch him being born via the Mill Pond web-cam, and this undoubtedly caused a definite personal connection with myself (especially watching the puppies grow over the next six weeks). Having this web-cam made the entire experience very fun, and very addicting. It created a great anticipation buildup while waiting for the time to pass prior to coming and picking the puppy up. (I believe that Cody is the first Mill Pond Canadian export to the United States, and he is now a Florida puppy). I have always been a big Retriever fan and owner (Golden's and Labradors), and candidly was extremely concerned about getting a puppy with so much "poodle" in him, as I'm not a poodle fan. Yet, over the years, my wife tired of all of the shedding that comes with the Rretriever breed, and didn't want another one...and then I discovered the "Doodle". I personally spent 6-7 months researching about every single article that has been published on "Doodles" and most certainly believe I have spent time on every single web-site created by owners and breeders. I settled on a GoldenDoodle versus Labradoodle, simply based on "looks", and then spent a great deal of time trying to discern the differences in dogs between F1's and F1b's...and then between tiny, petite, mini, small, medium, etc. It's quite confusing, especially with all of the other descriptors people are using such as "Teddy Bear", and English Standard, etc. I then found late this spring the Mill Pond Doodle web-site and was drawn to it's simplicity, it's clear message of not being a puppy factory, instead being a family that loves dogs and enjoys the pleasure of seeing their wonderful puppies go to their forever homes, and my timing was perfect as they still had a couple of slots left for a litter that was about to be born. We've had Cody 6 weeks now and I have the following observations. I can't get over the feel of his coat...it is unlike any animal I've ever seen. The softness is unbelievable, and imagine my shock when I first ran a steel prong brush through his coat and picked up the brush to look at it and NO hair/fur was on the brush! I still can't get over how non-shedding this puppy is. I tease people that he is going to be my new shoe-shine machine...his fur reminds me so much of one of those machines. He absolutely is a people dog...loves everyone and so far has never met a stranger. Even when he is let out of his cage in the morning, he has to get his morning pet in, before he goes and does his "business". I'm also delighted to see several Retriever qualities...from his face to his body and even to the way he jumps off of a couch or chair...he "leaps" outward, not down, exactly as a Retriever does in fetching a duck in a water, etc. So, after all of my years and all of my dogs that I've owned from childhood on...I can honestly say that this puppy is the very best dog I've ever owned much less seen, I will enjoy watching him grow up this year. Being able to own a dog with all of the wonderful looks and disposition of a Retriever, yet also having his own "Doodle" identity and not shed, is almost to good to be true. For anyone looking for a puppy such as this...you have found the right breed, and you have found the right breeder. 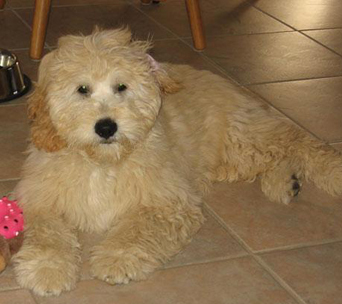 Producing friendly, quality miniature goldendoodles and goldendoodle puppies.